He returns to a place that looks like home, but it isn’t really a home anymore, and he moves on. Bridges and Powerlines’ “National Fantasy” is much more than a breakup song: It’s about the individual (and collective) search for meaning and home. It’s an ode to the dirt road each of us knows all too well, that journey of life that eventually finds friendly faces and familiar places changing. You can’t stop change; you can’t turn back time. Brooklyn five-piece Bridges and Powerlines are about to release their new album National Fantasy (10/7/2016 via Devise Records), but they’ve got one more surprise in store before that happens. Last week we premiered the band’s single “Even Killers Need a Home,” and today Atwood Magazine is proud to be premiering the music video for title track “National Fantasy.” There’s a lot to love about this forward-driving song, and even more to take away from its excellent visual accompaniment. But first, what does “National Fantasy” mean? Those words evoke a dream – a collective dream, the sum of our individual interpretations of a country versus the country itself. To quote the band, the words provide a great summation of this idealized view that we have of our country. “We were trying to capture the lack of direction and search for meaning that I felt we were seeing everywhere in the post-Great Recession,” they explain. What does “America” mean to the individual? Certainly (and especially in recent years) the answer differs greatly from person-to-person, American citizen to non-American citizen, teenager to adult, and so on. We know now that sense of security to be a false sense of security. Tensions are high, and “national pride” sounds to many like a foolhardy endeavor to bury and conceal terrible truths. Then you watch Bridges and Powerlines’ video, and you remember what the country can mean. There’s a lot of human and natural beauty in this world, and we cannot let our doubts and reservations consume and blind us. One must not be uninformed, but rather balanced: Acknowledging the good and the bad, the facts and the fiction. 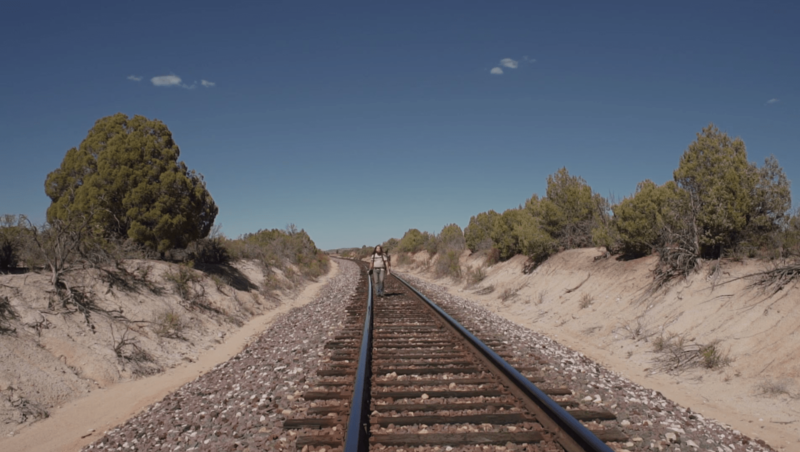 Directed by Christopher Arcella, “National Fantasy” depicts a bearded traveler “on a quest for direction.” He walks with the train tracks, following bubbling streams and stopping to absorb the world around him. He meets a man, perhaps a fellow lost soul, and the two enjoy each other’s company by a fire, the man sharing with him a picture of a face from long ago. Continuing on his way, our bearded hero finds himself “back home.” He knows this place: He the friendly, warm smile of the woman outside in the garden, the art and decor within… But something doesn’t feel right. It isn’t sitting well, and just like that he continues on his way, back on the road. “He returns to a place that looks like home, but it isn’t really a home anymore, and he moves on,” the band notes. It’s worth pointing out that our bearded traveler and his perhaps-companion are never seen in the same shot. Perhaps this is a flashback? Perhaps he truly does pop his head in and then leave suddenly. Regardless, this technique emphasizes their separate realities; she is comfortable where she is, while he is off, still searching for himself, or whatever it is that will find him peace and happiness. What are we searching for? What are our individual national fantasies? We are all on that one-way path alone, but we walk side by side with one another. Sure, “National Fantasy” can be listened to as a breakup song, but it goes so much deeper. It reminds us that life is a shared experience: That while we may all feel jaded and disillusioned, or lost, at sea and uncertain of where the tide flows, we are all on that same long journey. “If I sounded full of love, it’s just the wine and winter sun,” sings Andrew Wood in the chorus. 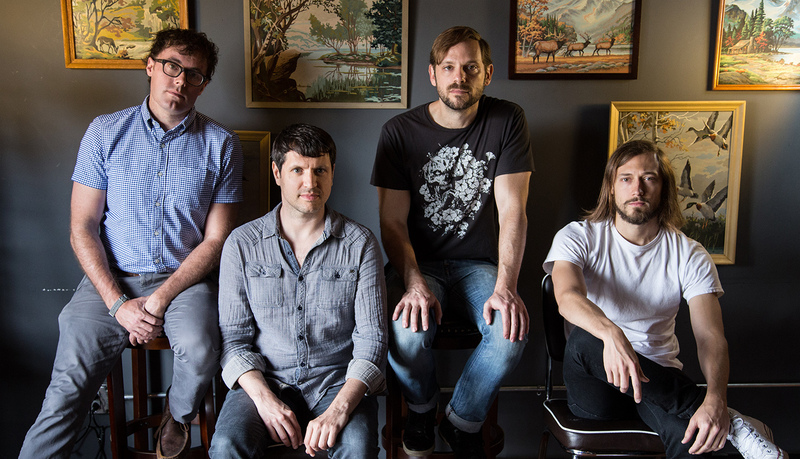 Behind his voice march the full band, building their sound from a light acoustic folk rock jam into a full, expansive frame that arouses the same need to get up and go as is felt in the video. 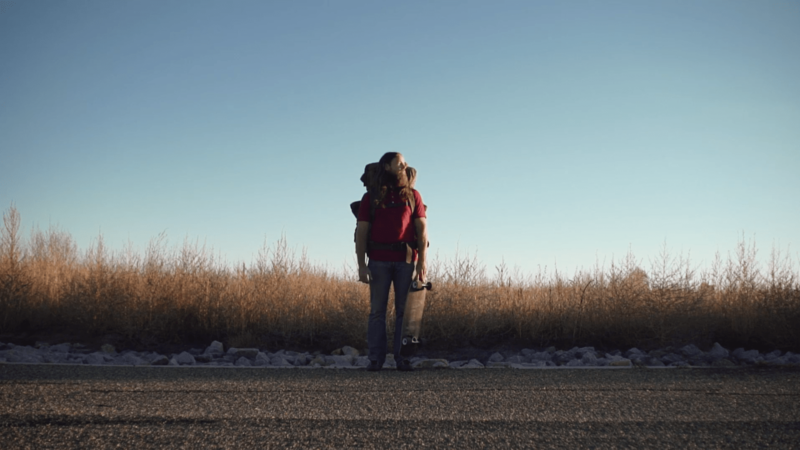 For a song so down and distant, “National Fantasy”s music video is almost uplifting – perhaps more so in a spiritual sense than in a literal one. The video depicts the band’s critical thought, the depth of their lyrics, and how far beyond the music they went in embedding and emotion experience into their final product. Bridges and Powerlines’ “National Fantasy” is much more than a breakup song. Preorder National Fantasy now in advance of its October 7 release, and learn more about the album and its title track through our chat with the band below! What does National Fantasy mean to you? Bridges and Powerlines: We came up with the title “National Fantasy” two years ago – it was a working title for the song and it was a joke about how the early versions sounded like the band the National. But then the title took on a life of its own — for several reasons. The crazy rhetoric of the election year started to really resonate with us, particularly issues surrounding immigration (the album cover is the Canadian border). Also, Dave (our guitarist) had a bit of an encounter at the border and a good friend of ours was actually denied entry back into the US at the same time. So you’ve got that very tangible episode, plus all the crazy language about what these candidates want to create and all the perceived “problems” here — and I felt like “National Fantasy” was a great summation of this idealized view that we have of our country — although the lyrics of the song itself are more of a break-up song. How did you incorporate the song's message into this video? In what ways is the video a separate entity? Who is the main character in this music video? Bridges and Powerlines: In the early writing phases of the album we were trying to capture the lack of direction and search for meaning that I felt we were seeing everywhere in the post-Great Recession. The main character has lost something – probably most literally the relationship with the female character – and he is on a quest for direction. He returns to a place that looks like home, but it isn’t really a home anymore, and he moves on. Bridges and Powerlines have come a long way to get to this album, and this place in time. What do the concepts of travel, change, and home mean to the band? Bridges and Powerlines: Travel and change are pretty integral parts of being a band. I’m not sure which is harder: Traveling to where we are in time was pretty easy — dealing with the changes was much more difficult. I think that the changes that the band has been through have almost always made us stronger — keeping a band together is not easy – and change is a pretty necessary catalyst for artistic endeavor. Home has been a fluctuating concept for us; we’ve always been an NYC band, but true to NYC-band form, we’ve all lived in many different neighborhoods and boroughs and trudged to rehearsal spaces all over town. Since we built our studio in 2014, though we’ve had a home base, which has been great, and has made the creative process a lot more comfortable. Now we will often cook a meal before we head down to the studio to rehearse or record, which is a really nice way to do things. Traveling to where we are in time was pretty easy — dealing with the changes was much more difficult. cover photo: still from Bridges and Powerlines' "National Fantasy"